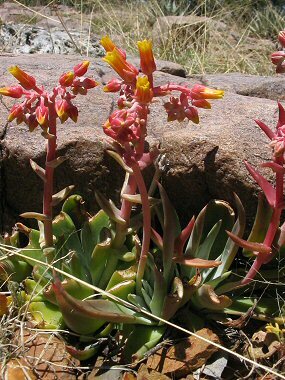 The Rock Echeveria is a member of the Orpine Family. This odd looking plant has grayish green succulent leaves that with reddish tips which grow in a rosette like an agave. The plant typically grows in dry, rocky desert areas at elevations between 3000 and 5000 feet. The Rock Echeveria is also known as the 'Live-forever'. The Rock Echeveria blooms between April and June, producing a number of deep red flower stalks to 18" in height, tipped with yellow, 5 petal flowers.